My oldest daughter, now 3 1/2 has recently become interested in time – when things take place, how long they will last, etc. I’ve been trying to explain things to her in kid-friendly ways that she can relate to. My mom would always tell me how they used to explain how long a plane ride was based on how many Seasame Street episodes long it would be! I will tell me daughter it will take 3 songs to get somewhere when she asks, or that when the short hand on the clock is pointing to the 10, we can go (we have a big analog clock in our kitchen). Recently I came up with an idea that I thought might help her understand when repeating events occur throughout the day – I like to call it our Picture Clock! You can make this at home very easily. 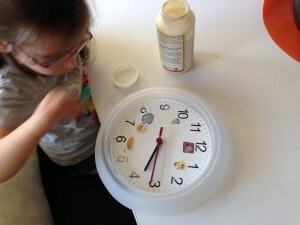 While my younger daughter was sleeping the other afternoon, my oldest and I made the clock together. Didn’t take much and we both had fun working together to do it. Any inexpensive, easy to read, clock will do. I happen to be at Ikea and they have one for $2. Then my daughter and I went searching online with Google Images and found clipart to represent different activities of our daily routine. She helped me choose a sun for waking up, a moon and stars for bedtime, grapes for morning snack, crackers for afternoon snack, a lunch bag for lunchtime, a funny face making the quiet signal for nap time, and macaroni and cheese (of course!) for dinner. You can add more or less to your clock, of course! We printed out the small graphics, cut them out, and then “construction” on our clock began! First we took off the plastic cover on the face of the clock so we could glue on our pictures at the right time. I had my daughter use a paint brush dipped in Mod Podge, but regular glue would work too. 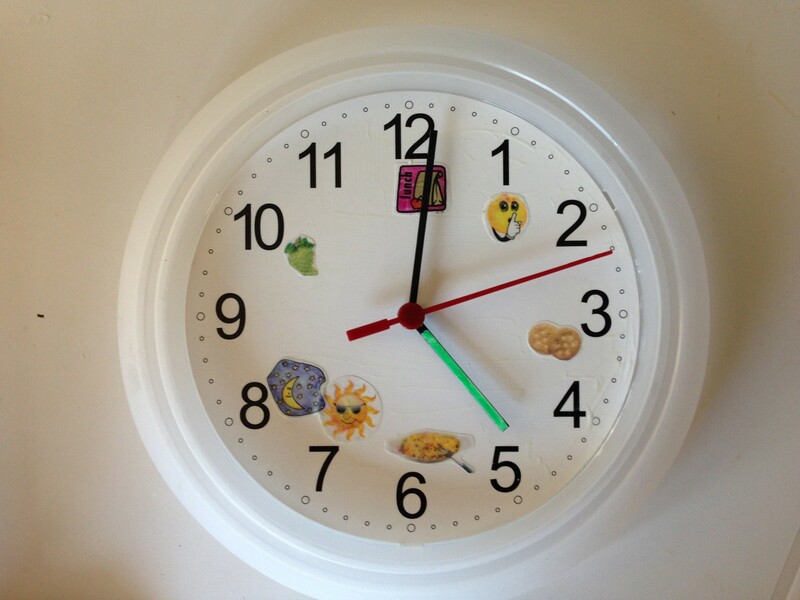 I chose Mod Podge because I wanted to cover the entire face of the clock with a coating to be sure the pictures stayed well on the clock and Mod Podge is great for providing a clear coating. You can find it a crafts stores. After all the pictures were in the right place I needed a way to identify which hand on the clock (the hour hand) was the one for her to focus on pointing to the pictures. So with a bright green paint pen I coated just the hour hand. 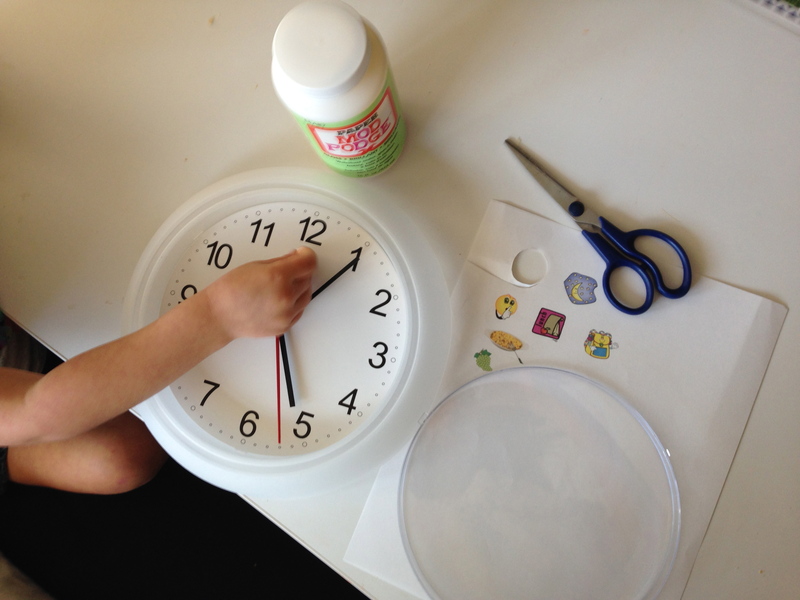 We discussed each hand on the clock, but for a preschooler, simply understanding the hour is a good starting point. What a great idea! I saw this clock during a recent family visit and thought you bought it. I should have knwon that you (and Allie) created it just for your family.